She began studying music in Iowa and, in a way, has adapted the spirit of constant improvement that a discipline as complex as musicology requires to pastry. In fact, pastry was something that she has been passionate about since childhood. Later on it became the work that she carried out in a complementary way while practicing her music studies, but which ended up becoming her main passion. 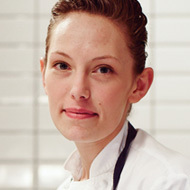 After passing through the Culinary Center in New York and her work in the kitchens of Porter House and Jean Georges, she entered the restaurant team Per Se by Thomas Keller in 2009, where she later became a pastry chef. There she carries out her work with a clear team spirit, taking into account that the main creative challenge is to make something that is not strictly necessary, a dessert in the context of a luxury restaurant, something impressive and that helps the client feel like their time there was worth it.